The McNulty Scholars Lecture Series hosts guest lecturer Celeste M. Nelson, Ph.D., Professor, Departments of Chemical & Biological Engineering and Molecular Biology at Princeton University. Dr. Nelson completed her Ph.D. in Biomedical Engineering from the Johns Hopkins University School of Medicine, followed by postdoctoral training in Life Sciences at Lawrence Berkeley National Laboratory. Her laboratory at Princeton specializes in using engineered tissues and computational models to understand how mechanical forces direct developmental patterning events during tissue morphogenesis and disease progression. She has authored more than 100 peer-reviewed publications, and has been recognized for her work with a Burroughs Wellcome Fund Career Award at the Scientific Interface (2007), a Packard Fellowship (2008), a Sloan Fellowship (2010) the Allan P. Colburn Award (2011), a Dreyfus Teacher-Scholar Award (2012) and a Faculty Scholars Award from the Howard Hughes Medical Institute (2016). 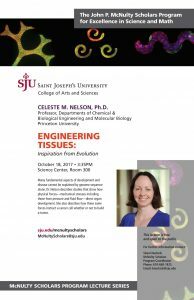 The lecture, “Engineering tissues: inspiration from evolution,” will take place in the Science Center, Room 300 at 3:35 p.m. The lecture is free and open to the public. The McNulty Scholars Lecture Series hosts guest lecturer Dr. Alison Sweeney, Assistant Professor, Department of Physics & Astronomy at the University of Pennsylvania. Dr. Sweeney followed an unusual route to her current position. As an undergraduate, she majored in biology and Russian language, and then earned her PhD in biology at Duke University. Her work identifies systems in which biological evolution has produced soft and optical materials with novel functions that human engineers are unlikely to develop. She has discovered area-efficient photosynthesis for biofuels in giant clams and self-assembling complex lenses in squids. She has been recognized for her work with a Bartholomew Award from the Society for Integrative and Comparative Biology, a Sloan Fellowship and a Packard Foundation Fellowship. 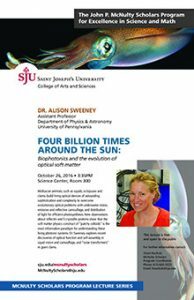 The lecture, “Four Billion Times Around The Sun: Biophotonics and the evolution of optical soft matter,” will take place in the Science Center, Room 300 at 3:35 p.m. The lecture is free and open to the public. The McNulty Scholars Lecture Series hosts guest lecturer Dr. Omowunmi (Wunmi) Sadik, Professor and Director of the Center for Advanced Sensors and Environmental Systems in the Department of Chemistry of the State University of New York at Binghamton. Dr. Sadik completed her Ph.D. in Chemistry at the University of Wollongong in Austrialia, and did her post-doctoral research at the US Environmental Protection Agency. She is a fellow of the Royal Society of Chemistry and of the American Institute for Medical & Biological Engineering. She is the recipient of Harvard University’s Distinguished Radcliffe Fellowship, and serves as the President and Co-Founder of the Sustainable Nanotechnology Organization. Her research focuses on new, more objective concepts in pain transduction using multidimensional biosensors developed for markers of acute and chronic pain. She holds 4 US patents for her work on biosensors. 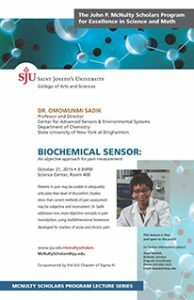 Her lecture, entitled Biochemical Sensor: An objective approach for pain measurement, begins at 3:35PM in room 400 in the Science Center. This lecture is free and open to the public.